If you’re anything like me, you may really enjoy a leisurely, more indulgent breakfast on the weekends. I’m a big fan of pancakes, French toast or an omelette. One thing I’m not such a fan of: the amount of fat and calories that tend to come along with these delicacies. Eggs Benedict is great, until after you’ve scooped up the last bit of hollandaise and the food coma begins to set in. 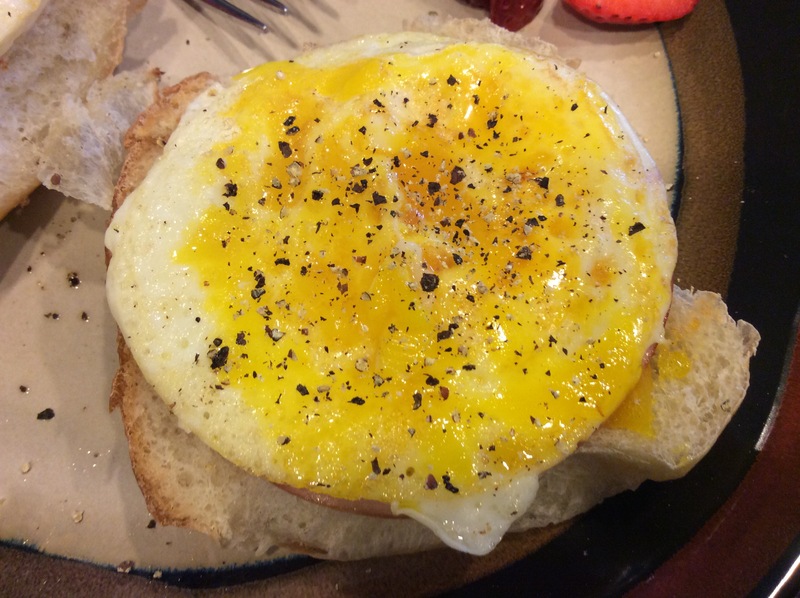 To avoid this feeling, my fiance, Sean came up with a much better solution to the indulgent, yet still healthier breakfast we crave on the weekends: the healthier open-faced breakfast sandwich. Anyway, we were craving a good breakfast, I needed to make sure to get some quality protein in my diet and lately, Sean’s been a big fan of the egg sandwich during the week, so he decided to take the idea and make it more decadent and akin to the hollandaise-laden dishes you might get at your favorite breakfast spot, minus the heart clogging properties. And thus, the healthier open-faced breakfast sandwich was born. It doesn’t need anything fancy either, just some nice buns, eggs, ham and a few minutes of time. Revel in its tastiness and feel smug at the same time for still eating healthy on the weekend. Heat 1 tsp. of butter in a skillet over medium heat, and turn on the oven broiler. Drop the four pieces of ham into the skillet to heat up – this should only take a minute or two tops. While the ham is heating up, slice the hamburger buns in half and set them under the broiler to toast. After the buns have toasted for about 1 minute, remove them and spread the remaining butter on the toasted buns, then add one slice of ham to each bun. Crack two eggs into the skillet (if you have egg molds for fried eggs use them now) and fry them until they’re just done and the yolk is still soft in the center. Place the two eggs on top of the ham and fry the other two eggs the same way. Once all the eggs have been added, gentle pierce the yolk with a fork to spread the yolk around on the rest of the egg and sprinkle with salt and pepper to taste. Optional: Add shredded cheese of your choice to the tops of the open-faced breakfast sandwiches and enjoy! Who needs hollandaise when you’ve got yolk? 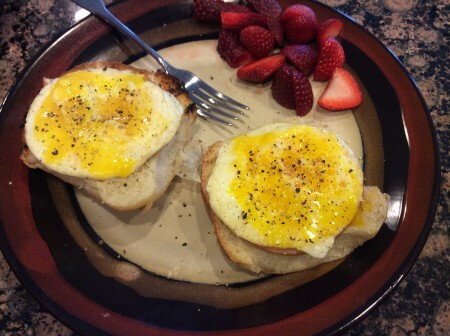 This entry was posted in Breakfast, Recipes and tagged Breakfast, Breakfast Sandwich, Eggs, Ham, Healthy, Healthy Breakfast, Healthy Breakfast Sandwich, Recipes, Sandwich on March 29, 2015 by Paige N..